Management is the center of any business entity. Be it a hospital, a social organization or an industry there are also need for management to keep the person on their right track. Setting appointments is also a part of management because it takes a lot of work. You have to make sure that the person for whom the appointment is set is free at the specific time. You have to look out for any overpasses and overlapping between different appointments. You have to see the nature of the appointment to prepare accordingly. But none of these could be possible without properly noting down each and every appointment. Businesses set up large meeting. Most important people have assistants or secretaries hired just to do this one job of setting appointments. So it is a pretty big deal for the executives. Now that established that, it is an integral part of any business we must know how to counter it. To efficiently keep track of all appointments one must prepare a proper binder, an appointment sheet or calendar and notify when the date is due. It is crucial that the person you’re setting up these appointments for is perfectly comfortable with the time and venue of the meeting or interaction. 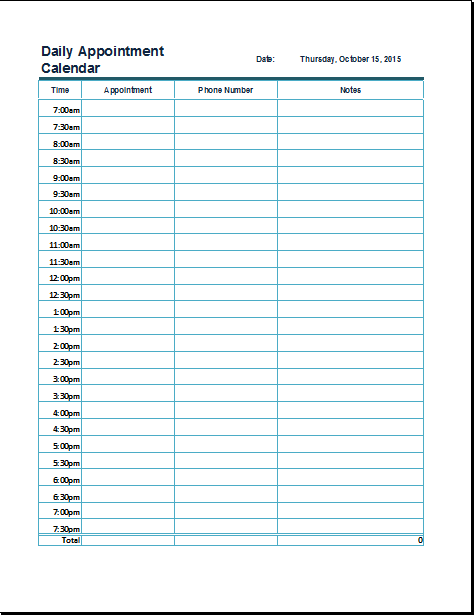 Our daily appointments calendar has a very businesslike feel with time slots for each 30 minutes from 7:00 am to 7:30 pm. It covers the most working hours that are present through the world for any job. View our appointments calendar now and note down everything without hassle. Today many offices have shifted to a much more advanced method of marking attendance.